This charming apartment complex is located just 500 metres away from the beach in Acharavi. Lying just 200 metres from the vibrant centre of the town, up a small hill guests can enjoy the best of both worlds. 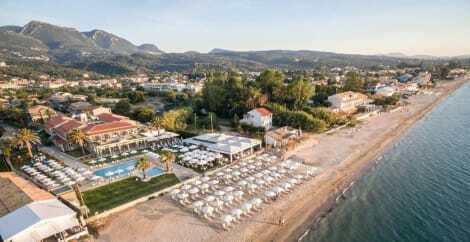 Guests will find themselves in close proximity to a number of the area's main attractions, and just 38 km from the lively town of Corfu and the port. This delightful apartment complex greets guests with the promise of a relaxing home away from home. The apartments and studios are tastefully appointed, providing a peaceful setting in which to unwind at the end of the day. The accommodation options come complete with modern amenities for added comfort and convenience. The complex affords guests a number of excellent facilities and services, ensuring a relaxing stay. With a stay at Tassos Apartments, you'll be centrally located in Corfu, a 3-minute drive from Acharavi Beach and 7 minutes from Roda Beach. This aparthotel is 8 mi (12.9 km) from Canal d'Amour and 7.5 mi (12.1 km) from Sidari Beach. Featured amenities include wired Internet access (surcharge), limo/town car service, and dry cleaning/laundry services. Self parking (subject to charges) is available onsite. V.A Boutique Apartments & Suites offer Boutique apartments and Suites just a short walk from Acharavi centre and its beautiful beach. With an outdoor pool, landscaped gardens and theme room, this quaint family-run hotel is perfect for families and couples looking for a relaxing Corfu escape.With a range of 6 themed apartments with modern facilities, the peaceful V.A Boutique Apartments offer something for even the most discerning holidaymaker. Tastefully decorated, the rooms offer free wifi, a balcony/patio area and a fully equipped kitchen with dining area.The V.A Boutique Apartments are focused towards art, and you'll find the hotel to be crammed full of oddities and decorations. There's a children's pool and playground for that extra bit of entertainment.The gardens are landscaped and there are booths, beds and sitting areas hidden away where you can relax and enjoy a drink. With a stay at Lena Mare Boutique Hotel in Corfu, you'll be a 5-minute drive from Acharavi Beach and 10 minutes from Roda Beach. This aparthotel is 8.5 mi (13.7 km) from Canal d'Amour and 8 mi (12.9 km) from Sidari Beach. Dip into one of the 4 outdoor swimming pools or enjoy other recreational amenities, which include a fitness center. Additional amenities at this property include complimentary wireless Internet access and gift shops/newsstands. Make yourself at home in one of the 38 individually decorated guestrooms, featuring minibars and flat-screen televisions. Rooms have private balconies or patios. Complimentary wireless Internet access is available to keep you connected. Private bathrooms with showers feature rainfall showerheads and designer toiletries. lastminute.com has a fantastic range of hotels in Acharavi, with everything from cheap hotels to luxurious five star accommodation available. We like to live up to our last minute name so remember you can book any one of our excellent Acharavi hotels up until midnight and stay the same night.